In January 2008, the Trust embarked on an ambitious habitat restoration project at Wyeswood Common which involved purchasing 42 hectares of dairy pasture. Located next to the Pentwyn Farm reserve, the project is transforming what was modern agricultural land – impoverished as far as wildlife was concerned – into an intricate mosaic of habitats rich in biodiversity. A couple of hundred years will be required for this vision to be fully achieved! 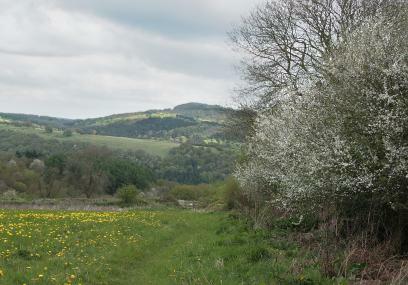 Wyeswood Common is set within the Wye Valley Area of Outstanding Natural Beauty. The reserve commands stunning views of the surrounding countryside, including the wooded valleys to the north and south. The habitats on the reserve include oak woodland, pasture, species-rich hedgerows and seasonal ponds. The fields are currently managed for hay and silage and as permanent pasture for sheep. Together with the adjacent Pentwyn Farm, this is the Trust’s largest reserve. The restoration work taking place at Wyeswood Common is an example of landscape-scale conservation – reinstating habitat connections over large areas of the countryside to reverse habitat degradation and fragmentation and helping wildlife to be more resilient to factors such as climate change. The project links Wyeswood to nearby reserves and wildlife-friendly areas, creating an interconnecting landscape. We are in the process of creating a species-rich habitat mosaic that will be managed as wood pasture by extensive grazing, reminiscent of the open forest of prehistoric Britain. This is being achieved by avoiding the use of fertiliser and by focusing on a number of management initiatives. The Trust’s flock of Hebridean and Hill Radnor sheep are grazing the pasture. These hardy sheep help produce a patchwork of short and tall grasses, ultimately encouraging a more diverse sward. In 2014 summer cattle grazing was re-introduced onto Wyeswood Common to further increase the diversity of the sward. Several management treatments will be used across the reserve to begin the process of establishing species-rich grassland. In addition to grass cropping, winter sheep grazing is used so that nutrient levels in the soil are reduced, grass species become less dominant and a range of flowers can begin to appear. Wyeswood Common is being used as a receptor site for the Coronation Meadows project, where green hay and wildflower seed are spread onto the fields to increase species diversity. Uncultivated field-margins add to the site’s diversity, by creating buffer zones between the fields and hedgerows. The tussocky grasses and scrubbed-over corners create thickets which are ideal habitats for small mammals and birds. Through tree planting and natural regeneration, new woodland is emerging. The species planted compliment the neighbouring woodland and include sessile oak and ash with field maple, hazel, cherry, hawthorn and birch. Smaller blocks of trees, planted near Pentwyn Farm at lower stocking rates, allow for scrubbier habitat to re-generate which is of particular value to bird life. Mature hedgerows and thickets border the reserve and provide networks of habitats connecting to the surrounding countryside. The Trust is practising traditional hedge-laying and planting additional hedgerows to strengthen wildlife corridors between Wyeswood Common and Pentwyn Farm. Species-rich hedgerows provide a good source of berries, fruit and nuts for birds and small mammals such as dormice. Restoring woodland ponds and creating new wet areas is attracting dragonflies, damselflies and amphibians to the site. In the spring, you may be lucky enough to hear the sweet song of the skylark. Other birds which become more active this time of year include bullfinch and the occasional red kite. Yellowhammers are once again singing on the farm after many years of absence! The skylark is a small brown bird renowned for its display flight and song. Skylarks regularly nest in the fields of the reserve. Autumn is a good time of year to experience the dramatic views of the Wye Valley woodlands and the vivid autumn colours. There is evidence that dormice are found in the species-rich hedgerows, feeding on the rich food supplies that the hedgerows provide at this time of year. A wide range of other species are expected to colonise Wyeswood Common as the restored habitats become more established. The reserve consists of gently-sloping grassland and woodland. The ground is uneven in places and there is a steep hill. It is important to keep to the footpath and way-marked trails as Wyeswood Common is a working farm and machinery and livestock may be present. Please keep all dogs under close control when visiting the reserve. For directions to Wyeswood Common see Pentwyn Farm – the two reserves are adjacent to each other and share the same car park. The main entrance to Wyeswood Common is from the car park by Pentwyn Farm’s Medieval barn. Pentwyn Farm is located next to Wyeswood Common. Prisk Wood and New Grove Meadows are also close by. There are good walks on the other side of the river, including the Offa’s Dyke Path, which can be reached by crossing the old railway bridge on foot. For more ideas on what to see around the reserve, see the entry for Pentwyn Farm, or for features of interest slightly further afield, look up the entry for New Grove Meadows. Parking is available at the adjacent Pentwyn Farm reserve by the medieval barn. Please do not park on the village green.